Quinta Matalva is beautiful and spacious five bedroom villa divided into a Main house for six guests and a Cottage for four guests. Quinta Matalva Main house has three bedrooms, three bathrooms, a sitting room, kitchen, dining area, a large terrace and swimming pool. 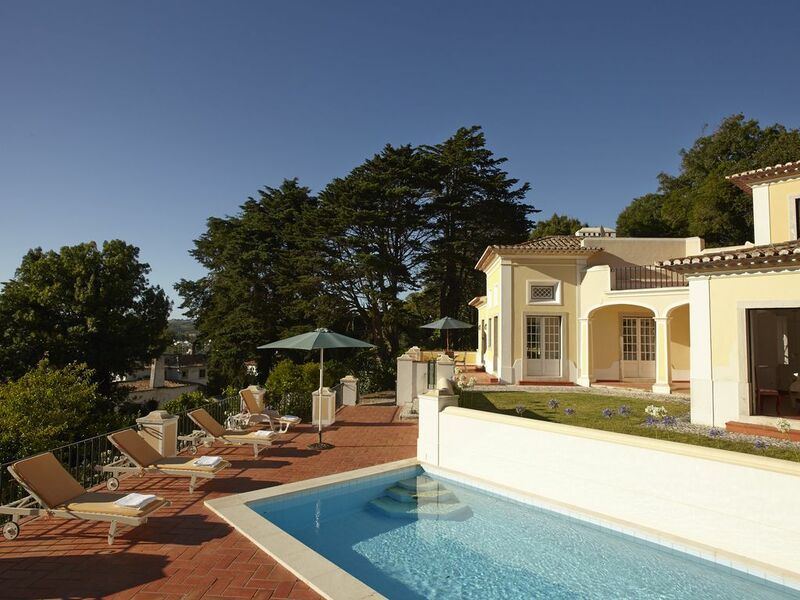 Set in the beautiful, historic, UNESCO protected mountain range of Sintra, Quinta Matalva is a private villas located in a secluded valley with pine forest backdrops and views of the sea. The Quinta is accessed down an off-road track that leads to only 4 Quintas ensuring seclusion and calm. Quinta Matalva has three bedrooms in the main house and a further two in a cottage so it's perfect for a small group renting the main house only or a group of 10 who can rent the cottage too. The main house has a wide terrace which is ideal for barbecues, drinks and outside dining. Through a gate from this terrace are steps down to a private swimming pool with another terrace and sun lounges. From the main house, walk through a colonnade to the cottage which has a separate kitchen, sitting room and terrace with a dining area, ideal for anyone in the group requiring privacy such as a family with young children or grandparents. From the entire property there are superb views of the historic botanic gardens of Monserrate and terraces of oranges, lemons and fig trees. Golf details: The following golf courses are approximately 15-30 minutes drive from Quinta Matalva. Golf do Estoril, Estoril is one of the most traditional and classic clubs in Portugal, host to Portuguese Open. 18 hole, par 69, 5238 metres 9 hole, par 34, 2350 metres. Tel: 351-1-4680176 / 4680054. Fax: 468-2796. Golf Estoril-Sol, Linho 'One of the most beautiful 9 hole courses in Europe.' 9 holes, par 31 - 1749 metres. Tel: 351 1 924 03 31. Fax: 351 1 924 03 31. Penha Longa Golf Club, Sintra. A quality course with spectacular scenery. 18 hole par 72 championship course, 6228 metres; 9 hole, par 35, 2550 metres. Tel: 351 1 924 00 14. Fax: 351 1 924 90 22. Quinta da Marinha, Cascais. Beautiful location overlooking Atlantic Ocean. 5 par 5's, 6 par 3's 18 holes par 71, 6014 metres. Tel: 351 1 486 9881/9. Fax: 351 1 486 9032 486 9159. Quinta da Beloura, Sintra. Designed by William Roquemore Jr. Six lakes on course add to interest. 18 holes par 73, 5817 metre. Guide and Catering services: These are available upon request. We stayed at Quinta da Matalva for 10 days in April 2017. Communication from the English owner by email was good, and when we arrived we were met by a member of his family who was friendly, relaxed and helpful. There were beautiful fresh flowers and fruit in the house, picked from the garden, as well as bread, milk and wine - a wonderful welcome. During the stay the house and pool were looked after by the friendly and helpful Ana. The house was clean and very spacious, and the terrace is wonderfully secluded - you can barely see any other houses as you look out on a fabulous view over the mountains to the sea. The balcony off the main bedroom is gorgeous in the evening as the tiled bench warms up in the sun during the day. The Sintra area is absolutely amazing. The nearby palaces and gardens provided many days of exciting discovery. Though they got busy, we found it was easy to escape the crowds as their grounds are so vast. Our children enjoyed exploring them - especially the tunnels at Quinta da Regaleira. Although the driving along the nearby steep and narrow roads was a little challenging at first, we got used to it quickly, and found other drivers to be patient and understanding. We were able to manage without a car on a few days, walking to Quinta da Regaleira and down into Galamares to catch the vintage tram to the beach at Praia das Maçãs. Monserrate Palace is also wonderful and walkable from the house. We also spent a day in Lisbon (parked and rode the Metro from Reboleira) and one of the highlights was our catamaran trip from Setúbal to see the dolphins who live in the Sado estuary, driving back through the stunning Parque Natural da Arrábida. An amazing holiday and Quinta da Matalva was a delight. This rental was our best ever. Everything was as promised from our dealings with the manager and staff to the beauty of the property and its meticulous upkeep and condition. Travelling as three couples, we rented the main house for two weeks. Our arrival was delayed but we were met at close to midnight by a most friendly lady who set the tone for a memorable and glorious holiday. Portugal and its people are tops. Prices were well below our expectations with a taxi for six into the beautiful town of Sintra costing only 10 euros! Our family of 6 adults and an 18 month old baby spent a week in the larger of the two houses and had a wonderful stay. The house was very clean and inviting upon arrival and very much more spacious than we had envisioned. The bedrooms are large and comfortable and open out to the view down the valley. The upstairs bedroom opens onto a private terrace and the two downstairs rooms onto the main terrace above the pool. The living area also opens onto this terrace and there is an outside dining table which we ate at nearly every night of our stay. Below the main terrace there is a fenced off pool area where we also spent a lot of time sunbathing or cooling off. The setting is secluded down a narrow lane about 10 minutes drive out of Sintra. You will need a car to come and go but in any case a car would be a good idea to explore this area. We enjoyed shopping at the local food markets, visiting the palaces in Sintra, kite surfing in Guincho, surfing in Ericeria and day trips into Lisbon. We would highly recommend the property and the area for a holiday. Quinta de Matalva is located 2 miles from the small historic town of Sintra and within the UNESCO protected Sintra mountain range. Lisbon is 30 miles to the south, and the Atlantic coast is approximately 5 miles to the West. The week where Christmas and Easter falls, an extra 15% is charged. 1 large gas bottle per house and a supply of wood are provided for central heating in winter. Any gas or wood requirements above this will be charged to the tenants. Electricity costs for the weeks between November and April are not included in the above tariff- a meter reading will be used and charged accordingly.